Click Here to view the full warranty PDF. We don’t just do everything. We fix everything! Great News! Besides all of below details, Our life time warranty now covers more glass breakage! For details, please check with our service group! We are committed to bringing you products of the highest quality and value. Our made-to-order manufacturing philosophy is one example of our commitment. Please view the information below for full warranty details. 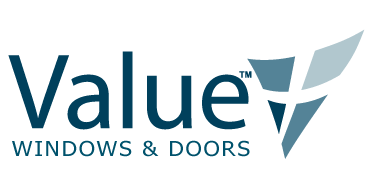 At Value Windows & Doors serving Houston and Stafford, TX, we are proud of the quality workmanship of our custom vinyl windows and doors and are pleased to offer you the following Full Lifetime Warranty. We warrant our products to be free from defects in material or workmanship that significantly impair their proper operation for the lifetime of your home as long as you own it. 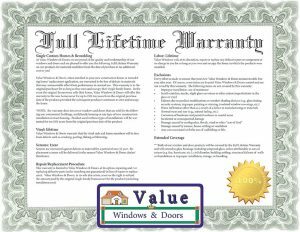 The lifetime coverage of this warranty applies to original owners of single-family homes and owners of single-family homes who purchase Value Windows and Doors for remodeling or replacement. This warranty is to the original purchaser for as long as they own and occupy their single family home. In the event the original homeowner transfers ownership of the home, this warranty may be transferred to the new owner for up to ten years from the original date of purchase. Any warranty claims will require proof or purchase and of continuous ownership. Color Coating warranted for fifteen years from date of purchase. *NOTE: The warranty does not cover windows and doors that are sold for the following use: commercial buildings, multifamily housing or any type of new construction installation in tract housing. Product used in these types of installations will be warranted for ten years from the original purchase date of the product. Value Windows & Doors serving Houston and Stafford, TX warrants that the vinyl sash and frame members will be free from defects such as cracking, peeling, flaking, or blistering. Screens are warranted against defects in material for a period of one year. Replacement screens will be delivered to the nearest Value Windows & Doors dealer/distributor. Misalignment of grilles/muntins of 1/8″ or less from appropriate position. Minor blemishes in the glass that do not significantly impair the structure or vision through the glass including slight glass curvature. 4. For quality assurance purposes, all window and patio door products should be of title inspected by the Original Purchaser prior to, or at the time of installation or upon transfer to the Original Occupant. 5. The warranties set forth above are expressly in lieu of all other expressed warranties and of all other obligations or liabilities on the manufacturer’s part. The manufacturer neither assumes, nor authorizes any other person to assume for the manufacturer, another liability in connection with the sale of the product. The warranties as described herein are the exclusive remedies for breach. There are no warranties that extend beyond the description on the face of this document. The manufacturer makes no warranty whatsoever with respect to accessories or parts not supplied by the manufacturer. 6. The warranties cover materials only and the manufacturer does not assume any expense or responsibility involved with the removal and/or reinstallation of any replacement parts. The manufacturer’s obligation under the warranties is expressly limited to, at the manufacturer’s option, replacement or repair of any defective part or component. The manufacturer reserves the right to discontinue the model or models manufactured under these warranties. Any discontinued parts or components may be replaced with an equivalent part at the sole discretion of the manufacturer. The manufacturer is not responsible for any color variation in the replacement part or component. The manufacturer is not responsible for any window which has been modified in any manner to accommodate an alarm system which may be attached to the product nor is it responsible for the reconnecting of the window to the alarm system. The manufacturer reserves the right to inspect any and all defects in the field. Field visitation(s) may result in service charges for non-warranty site surveys. 7. Under no circumstances is the manufacturer liable for consequential, exemplary or special damages including, but not limited to, damage or loss of other property or equipment. 8. Some states do not allow limitations on how long an implied warranty lasts and/or the exclusion or limitation of incidental or consequential damages, so the above limitations may not apply to you. These warranties give you specific legal rights and you may also have other rights which vary from state to state. Any inquiry with respect to the product must be made in writing and include the Original Purchaser’s name, address, date of purchase, product information from the product label and daytime as well as evening telephones numbers. 10. NON-TRANSFERABILITY: The warranties described above are non-transferable and limited to the Original Purchaser as described in Section 9 above. 11. If any part of the warranties described above are void or unenforceable in any State of the United States, the remaining portions will nonetheless continue in full force and effect.